This high temperature tape is heat resistant and heat reflective. The highly polished stainless steel foil coating reflects radiant heat and is an excellent choice for the protection of industrial wires, cables, hoses (hydraulics), pipes, tubing and equipment that is in close proximity to intense radiant heat sources such as super-hot metal slabs, liquid and molten metals or glass, open flame/plasma, engine exhaust manifolds, and for reflecting solar glint. The tape is slit from 21oz foil coated fiberglass fabric. These heat reflective materials generally reflect 95 to 98% of the infrared heat striking its surface. 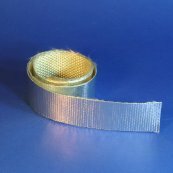 Heat reflecting tapes are available in sizes from 1/2" through 40" wide.